" Articles in Category: Larry Wilmore	"
During Tuesday night's Nightly Show with Larry Wilmore, the show lambasted Israeli Prime Minister Benjamin Netanyahu for showing up to showboat before Congress two weeks before his own election back home, and for misleading everybody on Iran. Is your country doing a bad deal with the Middle East? Is your President embarrassing you with decisions you simply disagree with? Did your country elect...a black? 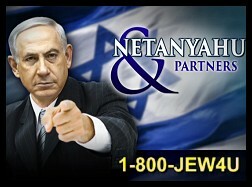 Then call the firm of Netanyahu & Partners and we'll immediately show up to any major event! Regardless of protocol! Including, speeches to one party of Congress! Presidential shame! And, of course, Bat Mitzvahs. If you hate your President for ideological reasons, we'll get you the justice Talk Radio says you deserve!